The Houthis carried out a coup against the power in September 2014 and took control of most of the country before the intervention of the Arab Coalition at a request from the legitimate President AbdRabbo Mansour Hadi in March 2015, with the aim of restoring the state. Saudi Arabia and the UAE lead the Arab coalition. In four years, the private interests of the UAE and Saudi Arabia have somewhat overshadowed the main goal, prolonged the war and caused more problems that make the end of the war difficult, with increasing civilian casualties. The war in Yemen is no longer a political-military war between the internationally recognized legitimate president and the Houthi militias. After four years, the war became economic, financial competition and a humanitarian burden. While the Arab coalition was announced on 26 March 2015 to restore the Yemeni state and bring down the coup, the Yemenis were looking for salaries, relief and a place of displacement. As militias of the Arab coalition were playing in the liberated areas, the Houthi militias transferred the areas under their control to feudalism special for the group and its leaders. It is no longer an economic activity in Yemen. It is only a war economy. There is no longer a state project but small projects that are fighting each other. Yemen's strategic position has turned into an ordeal at this difficult time as it could be a reason for regional and international interventions that may complicate the situation as the war is ongoing. The war has affected the country's economy, compounded the tragedy of citizens. Millions of Yemenis have fallen below the poverty line, many have become hungry, and the Houthi policies have initially led to this tragedy. After the Houthi withdrew the Central Bank's reserve of hard currency ($ 4.8 billion), the bank was transferred from Sana'a to Aden in 2016, but this was not enough to find solutions to pay salaries of all government employees. The Houthis refused to hand over revenues to the bank in Aden and in return the government refused to hand over salaries of government employees in areas controlled by the Houthis. The country remained without a budget. Despite a budget from the government of Ahmed Obeid bin Daghr, it was insignificant and was only in the government’s control areas. 1. The Houthi Economy: The Houthi armed group controls most of the northwestern provinces. During the war, the group established new economic centers that are visible in the capital Sana'a. They have put their hands on banks and telecoms, monopolized oil, gas and food trade and built customs points inside the cities. - Oil derivatives: In July 2015, the Houthis announced the floating of oil derivatives prices, adding five riyals per liter for the benefit of establishing a power plant and 54 riyals for the construction of an oil port, all added to the price of liter. At the end, the group did not abide by what it promised and turned those funds to the benefit of the group that set new financial centers. The group opened the door to the importing of oil derivatives by private companies, including companies that belong to the leaders of the armed Houthi group. The Houthis also managed to turn the oil derivatives market into a quick source of income and war financing. The value of one gallon, 20 liters, in Sana'a, is 7,000 riyals compared to 3,500 riyals in Marib, for example. The Houthis sell the gas cylinder for 8000 riyals in the black market and for 3500 riyals in neighborhoods through their agents, although the group buys the single tube of gas for 1200 riyals from the city of Marib where the Marib Gas Station is under the control of the legitimate government. Charges: The Houthi armed group imposes money on all merchants, businessmen and even small shops monthly, weekly or daily leases, may reach up to millions, under the pretext of "military effort." Taxes and Customs: In spite of levies, the armed group does not tolerate with taxes and customs clearance fees. Most companies have been pushed - under pressure – to pay taxes for coming years in an unusual precedent. As for customs, the group imposed two customs points, the first customs in Dhamar and the other in Amran, in addition to points at the entrances to Sana'a, to obtain customs fees for trades entering areas under their control, even though traders have already paid the taxes and customs at the main entrances of the country that are under the control of the legitimacy. These Houthi measures increased the burden on the people as traders add the extra cost to the price of goods. • The National Currency: The national currency collapsed by double. Before the war, the exchange rate of one dollar was 250 riyals, but with the entry of the fifth year of war, the exchange rate has become 583 riyals. The riyal had collapsed to the lowest level when the exchange rate of one dollar reached up to 800 riyals, but a Saudi $ 2 billion deposit helped the riyal recovers. In order to stop the demand for the currency from the market, the Central Bank of Yemen is financing the purchases of food with basic exchange rate 440 riyals per dollar in order to confront inflation, but many procedures make the "Bank of Aden" very slow. • Oil and Gas Exports: The Yemeni government suffers from repeated failure to export oil and gas outside the country. Despite the export of the first shipment began last year, but the security situation is pushing the government to stop the export under pressure from the UAE. The UAE is accused of obstructing work in oil fields in Shabwa, exporting oil through the port of Balhaf and the work of the port of Al Shahr in Hadramout. • Economic Losses: There are no accurate statistics of the economic losses; however, it is estimated that the country suffered heavy economic losses exceeding its initial estimates of $ 100 billion. On the macroeconomic side, some economic estimates indicate that Yemen's GDP shrank considerably during the years. The loss of real GDP was estimated at 47.1%. The real GDP losses between 2015 and 2017 estimated at $ 34.8 billion. The conflict has caused heavy losses for local companies. Preliminary results from a World Bank survey in October 2018 show that nearly 35% of Yemeni companies have closed their doors, with more than 51% of surviving companies suffer from dwindling activity and declining business. About 73% of companies that have stopped their activity pointed to security and financial hurdles as the main reason. In addition, the financial constraints, increasing input costs, loss of demand and loss of consumers are the main reasons for many companies to diminish. • Infrastructure Damages: Due to the ongoing war and the continued destruction of infrastructure from all sides, it is difficult to reach a comprehensive assessment of the damage. Therefore, what we will mention in this regard are preliminary estimates issued by some relevant parties. On the material losses side, 1518, some 2512 roads and bridges, 727 reservoirs and water networks, 185 stations and generators, 421 communications networks, 882 schools and institutes, 318 hospitals and health centers, and 1797 government facilities, 360 cars petrol stations, 265 fuel tankers, 316 factories, 295 poultry farms and cattle, 490 archaeological sites and tourist facility, and 112 sports facilities. • Government Employees: Government employees represent 31% of the country's total workforce. Most of them have not been paid for more than two years. This caused a bad crisis in the country due to the worsening of the employees living conditions. In February 2019, the United Nations said it had paid nearly 100,000 teachers $ 50 for each to continue education, but the amount was too small and not sufficient to support their families. So most of the government workers went to other jobs or went back to remote villages and towns, or turned into fighters - most of them Houthis - to get money. • The return of expatriates: Saudi national procedures and laws, known as "Saudization of professions," caused the return of thousands of Yemeni families to Yemen because of the Saudi policy of imposing new fees on expatriates. Yemeni investors in Saudi closed their businesses and some returned to Yemen or left for another country. This resulted in a reduction in money remittances to Yemen that relies on remittances as a source of hard currency, especially after the halt of oil and gas production. War Empires: Some individuals and groups have exploited their support for the legitimacy and the Arab coalition in Yemen to obtain illegal money from oil and arms trade, forming overlapping empires that serve only their own interests - some of them are involved in dealing with the Houthis. • Conflict over Ports: The attempts by UAE to put its hands on the ports of Yemen in the south resulted in freezing those ports and damages to the Yemeni economy. According to information, the UAE provides facilities at the port of Aden for ships coming from UAE ports, but it disrupts for weeks and maybe for months ships coming from other ports. The UAE has already caused damage to goods at sea or pushed ships to go back due to restrictions. The Chairman and CEO of DP World Group, Sultan Ahmed bin Sulayem, said that the Group is interested in Yemen and will start investing there as stability begins. The Jebel Ali Free Zone (Jafza), part of DP World Group, has achieved growth in its foreign trade of USD 83.1 billion in 2017, equivalent to 29.4 million metric tons. The growth rate was first since the year 2013 (the year before the Houthi coup in Yemen and before the UAE intervention), as the volume of trade at that time was only 19.5 million tons - an increase of 9.9 million metric tons. • The Saudi Deposit: There is no Saudi deposit in the accounts of the Central Bank of Yemen inside or outside Yemen, but in the Saudi National Bank. The disbursement should be approved by the Saudi authorities, not only the Yemeni authorities. This bureaucracy in decision making may lead to a significant delay in benefiting from the grant. It also means that Saudi Arabia is the guardian of the Central Bank of Yemen. The country has collapsed in the inferno of famine and epidemics. 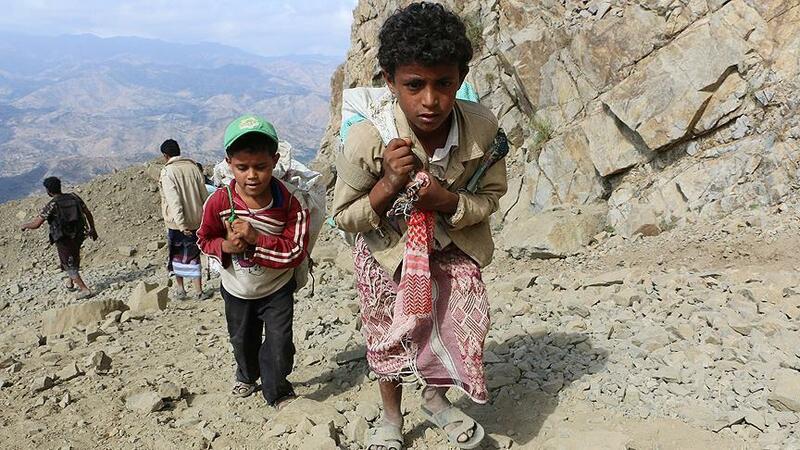 Yemen, which is already the poorest country in the Arab world before the war, is living in a tragic situation, as the United Nations figures indicate. Almost 83% of Yemenis need humanitarian assistance. Hunger and Disease: More than 20 million people across the country suffer from food insecurity, including nearly 10 million people who suffer from extreme hunger. About 7.4 million people need services to treat or prevent malnutrition, including 3.2 million people who are in urgent need for treatment for acute malnutrition - 2 million children under the age of five and more than 1 million pregnant and nursing women. Almost 17.8 million people lack access to safe drinking water and sanitation, and 19.7 million people do not have access to adequate health care. Poor sanitation and waterborne diseases, including cholera, have caused hundreds of thousands of people to become ill by 2018. Millions of Yemenis suffer from hunger, diseases and vulnerability. The number is increasing year after year as a result of the war, prompting an increasing number of people to rely on humanitarian assistance. But the arrival of aid is extremely difficult. Almost 6.5 million people currently live in 83 hard-to-reach areas, where humanitarian workers face moderate or high access restrictions, according to figures from foreign organizations. The Norwegian Refugee Council estimates that 63 per cent of the population living in these areas, nearly 4.1 million people, is in an urgent need of assistance. In the 83 hard-to-reach areas, 23 are facing severe restrictions and 60 face moderate restrictions. In 46 areas, out of 83 areas, that are difficult to reach, access to aid is mainly affected by war, mostly in al-Bayda, Hodeidah, Sa'ada and Hajjah. These regions represent 51 per cent of the population living in areas that are inaccessible. Another problem related to humanitarian aid is that it does not reach the targets. The Houthis turn these aids into three ways: the first is to sell them in the black market; the second is to hand them over to the group's allies and families of their fighters, and the third is to convey them to their fighters in the fighting fronts. Travel and Transportation: Yemenis cannot travel freely in the country. Government-controlled areas are run by security units that have a regional trend, which makes Yemenis from the northern cities in a difficult situation. They may be killed or expelled or treated as foreigners in their country. In the Houthis-controlled areas, surveillance is very strict against newcomers to residential neighborhoods, through community policing officers, and people are usually detained over suspicion or for money in return for their release. Moving from one governorate to another is becoming more difficult with the destruction of bridges and the lack of interest in roads. Residents travel through subways through villages to reach cities that may take long hours. Instead of traveling, before the war, from Sana’a to Taiz in five hours, it takes about 16 hours. Sana'a airport is still closed to commercial flights, only United Nations planes are allowed to land on its territory. The Coalition has prohibited access to it since August 2016. Yemenis suffer from high travel costs and persecution at airports in Aden and Sayoun. Certainly, the expansion of fighting in the country over time has led to an increase in the number of civilian casualties. The continued war has also hampered the arrival of relief to the besieged or the Houthi-controlled areas. The increase in the Houthi strikes by drones and ballistic missiles on Saudi territories has led to an increase in the coalition air raids. The Riyadh-based Arab coalition that has a border military base refuses to provide media with information on the rules of clashes and data about raids suspected by international human rights organizations, so the coalition-formed committee to inspect wrong raids has lost its credibility. The Abaad Center for Studies and Researches has observed the killing of 14100 civilians during the four-year-long war. The Center’s estimates indicate that more than 90,000 civilians, military personnel and militants have been killed over the past four years. 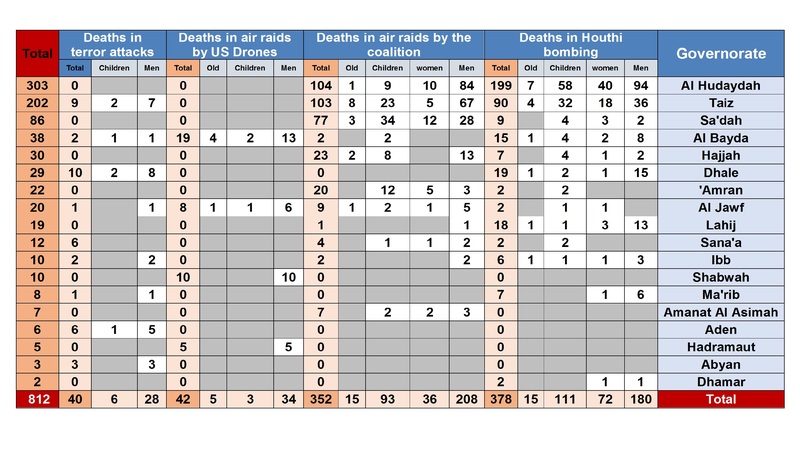 • Bombings: (378) were killed in Houthi bombing and (352) were killed in raids by the Arab coalition. The victims of the U.S. Drones attacks are around 42 civilians, and 40 people were killed in terrorist attacks. • Assassinations or death under torture: 74 people were killed in assassinations and under torture in Houthi prisons. 43 people were assassinated and killed under torture by forces, which are outside the legitimate government and funded by the UAE. And (38) people were ambiguously assassinated. Al-Qaeda assassinated 15 people, three people were killed by armed tribesmen, and two people were killed by government forces. • Sniping and live bullets: Al-Houthi group killed 477 people during the year, 81 people were killed by groups that work outside the legitimate government, 43 were shot dead by government forces, and 41 victims were registered against unknown killer. Tribesmen killed 39 people, while al-Qaeda killed 36 people. 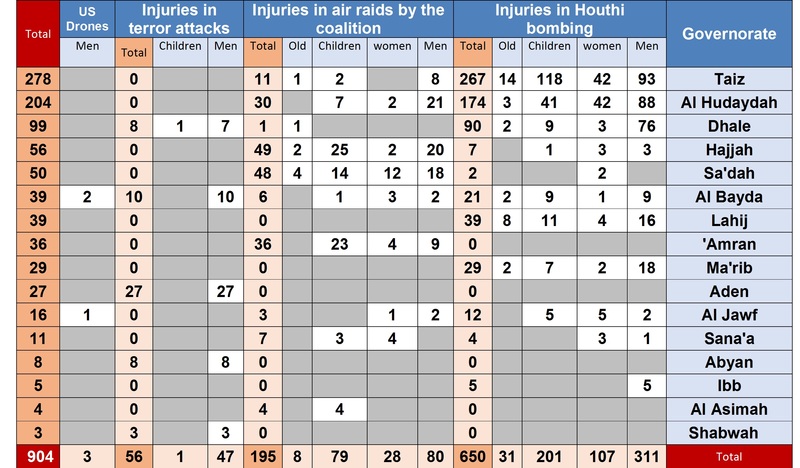 In addition, 904 people were injured in bombardment, 650 of them were injured in Houthi bombing, 195 in bombing by the Arab Coalition, and 56 in terrorist attacks. Three people were wounded in bombing by unmanned aircrafts. As for the cases of sniping and live bullets, 781 cases were recorded during the year. 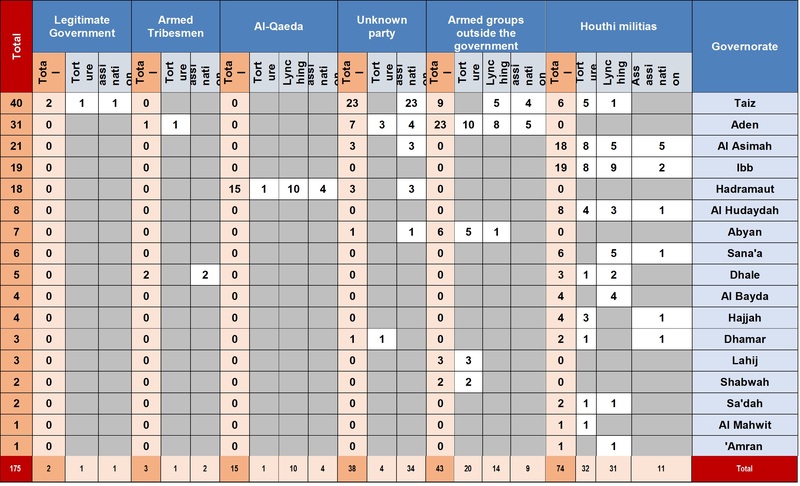 575 people were shot by Houthis, 76 were shot by militias outside the government, 56 were shot by government forces, 38 were shot by tribesmen, 22 were shot by unknown gunmen, and 14 were shot by al-Qaeda. There were other 330 cases of killings and 268 victims of landmines planted by the Houthis. The Houthis kidnapped 1970 people, whose whereabouts were identified, and 402 people who are still disappeared in unknown locations. In addition, 267 cases of torture were recorded in the Houthi prisons. As for the legitimate government, it arrested 175 people, disappeared 24 people in unknown locations, and three people were reportedly tortured in government prisons. As for armed groups outside the government, they abducted 80 people, disappeared 15 people and four cases were reportedly tortured by those groups. In addition, twelve people were ambiguously kidnapped and five people were reportedly tortured by Saudi authorities.